Used Seat Exeo Review - 2009-2013 | What Car? What's the used Seat Exeo saloon like? 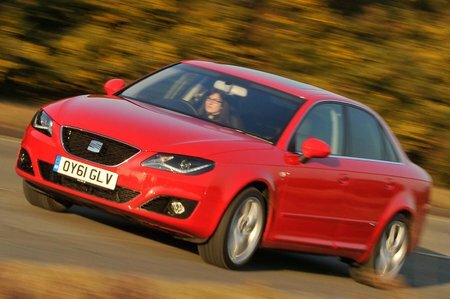 The Seat Exeo is based on the previous-generation Audi A4, so it grips well through bends and feels stable on the motorway. That said, the standard suspension allows too much bounce over high-speed dips and crests. Sport models have a stiffer set-up that negates this, but it's combined with 18-inch wheels, so the ride becomes unforgiving. The steering isn't ideal, because it's heavy around town and light at speed. The Exeo is reasonably well insulated from road noise, but there's some wind noise to be heard on the motorway. The diesel engines aren't as hushed as the class best, and you feel too much vibration through the steering wheel, pedals and gearstick. There is plenty of space up front, but the rear seats are decidedly tight on both head- and legroom. The boot doesn't measure up to the biggest in the class, but it's a decent size, well-shaped, and has split-folding rear backrests as standard. Every Exeo has stability control and electronic braking aids to help you avoid trouble. Front, side and curtain airbags, a driver's knee airbag and active anti-whiplash front head restraints are all on hand in case a collision becomes unavoidable. Deadlocks, an immobiliser and an alarm help to deter thieves.